more software for you all - made by me. I will be updating this and adding features constantly. Don't bother with the "this already exists" spam. I know this. I like to make my own software nevertheless. Last edited by xeztrixx; 01-30-2013 at 12:10 PM. Last edited by xeztrixx; 01-30-2013 at 12:19 PM. Looks very nice. I hate having to do it via wow-v and manually so this will make it much easier thanks! Last edited by xeztrixx; 12-17-2012 at 01:51 AM. Looking forward to the reupload! If you want to extend it a bit, and add a function that executes it into the DB instantly, then contact me and I can help you out. no thanks I like to update my own software. Nice, hurry up! 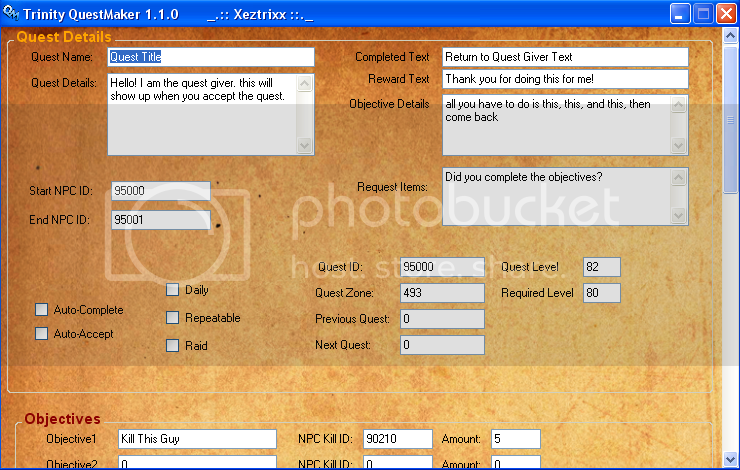 I want to get in to making quests for my server and am waiting on this app to do it. I could probably make one myself or just do the queries manually but this looks really nice. I've been learning scripting in the meantime while I wait for the upload.